There's something fun going on every week day in the Teen Room! For more information about Teen Room expectations and rules, please check out our In the Teen Room page or if you're interested in our Teen Clubs, Try It Tuesday and Whatever Wednesday programs, Thursday video game tournaments, or Friday afternoon movies click here! It could be a crossword puzzle, or a coloring sheet, or a photo scavenger hunt, but whatever it is, you're guaranteed some candy just for participating! The activity changes every week. One piece of candy per person per week. "Bored of being bored because being bored is boring?" Well there's no excuse to be bored in the Teen Room! Our "Boredom Cart" is stocked full of arts and crafts that you can grab whenever you want something to do! Or check out one of the many board games in our Cabinet O'Fun to play with your friends in the Teen Room! Sometimes you're just in the mood to build something cool. You can totally build something cool in the Teen Room. Check out one of our in-house maker kits, including: computer-parts sculptures, Legos, knitting/crocheting, drawing/sketching, friendship bracelets, Snaptricity, embroidery, MindWare Maze, and Geomag Building Kits. There are two new boys at Middleton High: Norman, who is eight-feet-tall and looks like he was put together after an accident, and Zack, the impossibly handsome transfer from Europe, and soon the three witch sisters, Esme, Katy, and Ronnie, are in an allout competition for Zack's attention--but Esme is also drawn to Norman, and he is the only one who seems to notice that students who go off alone with Zack seem to suffer from amnesia, or disappear entirely. After being thoroughly overwhelmed with all of the contemporary fiction I've read this year, it was really nice diving into a fun fantasy novel that wasn't too heavy or too fluffy. Bloom re-imagines a few of our pop culture lexicon of famous monsters and sticks them in high school which is both hilarious and brilliant. Esme, Kat, and Ronnie are witches who are also hormonal and catty, a combination that can't get very competitive and dangerous. Norman, the gentle giant, chooses hope over despair despite the tragedies in his life, and Zack, the mysterious loner dude who is basically allergic to sunlight and all food, is seductive yet compassionate. This character-driven story places real emotions (sometimes realistically exaggerated) in the hands of teens who are still trying to figure life out. The fact that they also have supernatural powers just ups the ante. I really enjoyed Bloom's voice, and can't wait to see what she comes up with next! 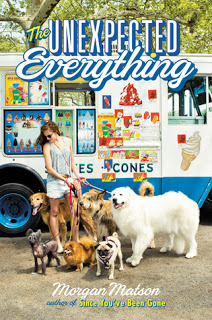 Seventeen year old Andie always has a plan, but when her father suffers a political scandal, her summer med school program is taken away from her, and she somehow ends up walking an insane number of dogs, she finds a lot of unexpected things can happen when you're busy making other plans. This adorable novel focuses on Andie's summer walking dogs (though she's never owned one) since her original plan doesn't quite pan out. And her father is spending time at home and actually paying attention to her, something that is new for Andie, since she's used to being pretty much on her own. She doesn't have close relationships with anyone since her mother's death. Her father, boys - she even keeps her best friends at a distance, that is until she meets Clark, an attractive homeschooled author, living on his own with a gigantic dog. Soon Andie finds herself opening up and forming real relationships with her friends, Clark, and eventually her father. Miss Matson's stories are beautiful and heartfelt, making readers reminisce summer vacations, best friends, and first loves. A perfect summer read!